Damen Shipyards Group has signed a contract with Abu Dhabi Ports and its subsidiary Abu Dhabi Marine Services (Safeen) for the supply of two new Damen ASD Tugs 2411, at the ongoing Abu Dhabi International Boat Show (ADIBS). The four-day show will conclude on October 20. 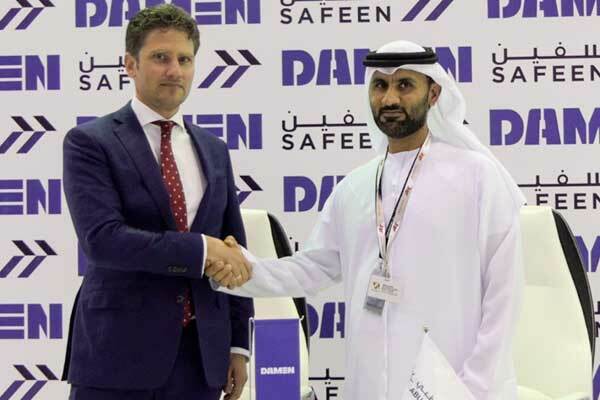 The contract was signed by Captain Adil Ahmed Banihammad, the acting chief marine services officer at Safeen, and Pascal Slingerland, regional sales director for Damen Shipyards Group, said a statement. Delivery of both vessels is due within three months, it said. Abu Dhabi Ports is a vital part of the Abu Dhabi economy, owning and operating 11 ports and managing over 55,000 vessel calls each year. The ASD Tugs 2411 will bring valuable additional vessel handling capabilities to the group. Examples of the class can be found operating all over the world and they are highly regarded for their excellent pulling power (70 tonnes), reliability and manoeuvrability, all contained within a compact, 24-m hull. The two tugs will join the 12 harbour tugs already in service with Safeen, the fleet operating subsidiary of Abu Dhabi Ports responsible for pilotage, mooring, vessel handing and towage at Abu Dhabi Ports, and will bring a new level of capability. In particular, they will be supporting vessel movements at Khalifa Port’s two container terminals managed by ADT/MSC and COSCO Shipping Port Limited (CSPL) as well as EGA’s berth for Bauxite shipped to its smelter in Al Taweelah. The three-month delivery timetable is possible due to Damen’s policy of building its most popular vessels for stock. The ASD Tugs 2411 are currently at being finished to the requirements of Abu Dhabi Ports / Safeen at Albwardy Damen, in the UAE, before sailing for Khalifa Port. The ASD Tugs 2411 will join three other Damen vessels already in the Safeen fleet; a Stan Tug 1907 delivered earlier this year and the Shoalbuster 2609 Al Maqtaa, delivered in 2016. The Al Shahama, a Damen Buoy Maintenance Vessel built in 1994 in Abu Dhabi under Damen Technical Cooperation programme, is also an active member of the Safeen fleet. Local warranty and after-sales support will continue to be supplied by Albwardy Damen from its facilities in the United Arab Emirates. “We are confident that they will be able to handle port operations for all kinds and sizes of vessels safely and effectively, including the world’s largest 400-meter container vessels with 20,000 TEUs capacity,” he said. “Furthermore, our Damen Services Hub is around the corner to provide Abu Dhabi Ports with support during the lifetime of the tugs,” he added. “The average size of a vessel has grown by 65 percent due to economies of scale and we recognise the importance of equipping our ports with the right equipment and logistics to adapt to these changing demands,” he added.